Apple introduced a new 2018 Mac mini in October 2018 with a similar form factor but significantly upgraded internals. The new mini comes in a darker Space Gray color and features Intel 8th generation Quad-Core i3 CPUs standard with optional 6-Core CPUs available. Available memory ranges up to 64GB, and internal SSD storage is available up to 2TB. Gigabit ethernet, 4 Thunderbolt 3/USB C ports, HDMI 2.0, 2 USB-A ports, and 10GB ethernet are all included. Apple's refreshed Mac mini includes modern Intel Core processors, better graphics, and faster networking, as well as a price drop to $499. Integrated Intel HD Graphics 5000 and Intel Iris Graphics deliver up to 90 percent faster graphics performance than the previous generation. Two Thunderbolt 2 ports, each delivering up to 20Gbps of bandwidth to each port, are included as well as next-generation 802.11ac Wi-Fi that is up to three times faster. 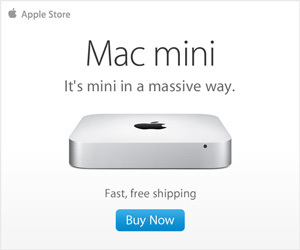 Mac mini comes in three standard models: a 1.4 GHz dual-core Intel Core i5 with Turbo Boost speeds up to 2.7 GHz, 4GB of memory, Intel HD Graphics 5000 and a 500GB hard drive starting at a suggested retail price of $499; a 2.6 GHz dual-core Intel Core i5 processor with Turbo Boost speeds up to 3.1 GHz, 8GB of memory, Intel Iris Graphics and a 1TB hard drive starting at suggested retail price of $699; and a 2.8 GHz dual-core Intel Core i5 processor with Turbo Boost speeds up to 3.3 GHz, 8GB of memory, Intel Iris Graphics and a 1TB Fusion Drive starting at a suggested retail price of $999.